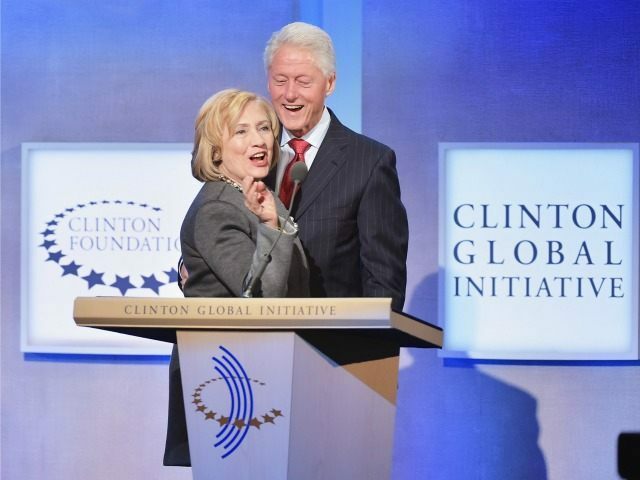 Senator John Cornyn (R-TX) called the Clinton Foundation’s fundraising “absolutely deplorable” in the years since the ranking Republican held up Hillary Clinton’s Senate confirmation over concerns of pay-to-play at her troubled charity. Before she became secretary of state, Hillary Clinton was forced to sign an ethics agreement with the Obama administration — a Memorandum of Understanding — forcing her to disclose all donations to the Clinton Foundation. However, Hillary Clinton did everything but. For more than a year, the Democratic presidential candidate has been dogged by allegations that she used her position as secretary of state to sell access to major Clinton Foundation donors. Hacked Democratic National Committee files revealed that the former head of the Russian uranium company UraniumOne, Ian Telfer, made four undisclosed Clinton Foundation donations totaling $2.35 million — a direct violation of Hillary Clinton’s promise to reveal the identity all her charity’s donors. Emails, published by government watch dog group Judicial Watch, show that major Clinton Foundation donors lobbied senior Hillary Clinton aide Huma Abedin and top Clinton Foundation staffer Doug Band for favors and special access while Clinton was secretary of state. Last week, a Reuters report revealed that the Swedish fundraising arm of the embattled Clinton Foundation failed to disclose the identity of donors who funneled millions of dollars in donations to the charity, despite Hillary Clinton’s promise to do so. Last year, Senator Cornyn called on the Obama administration to appoint a special prosecutor to investigate then-Secretary Clinton’s mishandling of classified information on a private email server she had installed before she took the helm at the State Department. “Once again the rules don’t apply to them like they apply to everybody else. Can you imagine if anybody else in the United States government had tried to get away with something like this? It wouldn’t have happened,” Cornyn told The Hill. Now, Cornyn wants a do-over. Knowing what he knows now, the Senator says he would have done more to slow or stop Clinton’s confirmation. In August, Bill Clinton promised that he will resign from the Clinton Foundation board if Hillary Clinton wins the White House in November. The chronic reports of corruption at the Clintons’ troubled charity are starting to show in the Democratic presidential nominee’s poll numbers. Now, a majority of Americans say Bill and Hillary Clinton failed to avoid conflicts of interest as millions of dollars flowed into their family foundation.